Canadian Farmland: The Best Investment of them All? 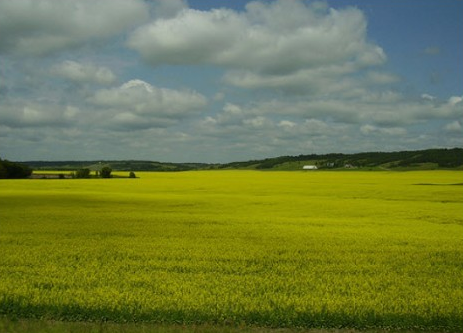 A Primer for Investing in Canadian Farmland. “Put your money in land, because they aren’t making any more of it!” – Will Rogers. When I think about burying some serious money for the long run, I think of farmland. I’m very bullish on Canadian farmland. My reasons: 1) Canadian farmland is very productive; 2) low cost on a global basis; 3) Canada is a stable country with a very adequate supply of water, energy and fertilizer; and 4) even the weather is cooperative as its growing season gets a little longer each year. Some of Rick’s readers ask for more details. When ever you invest in land as a non-resident, you need to check the local laws. For example, when I was a farm realtor I had a group of Italians interested in buying a 2000-acre farm in Illinois. Now Illinois has a law prohibiting non-resident aliens from owning farmland. But it doesn’t prohibit corporations from buying farmland. So, we created a corporation and bought the farm. How does this apply to buying a Canadian farm? The Dow made another post-financial crisis rally high Thursday. To provide some further perspective to the current Dow rally and in response to several requests, all major market rallies of the last 111 years are plotted on today’s chart. Each dot represents a major stock market rally as measured by the Dow with the majority of rallies referred to by a label which states the year in which the rally began. The difference between today’s chart and last week’s chart is that for last week’s chart a rally was defined as an advance that followed a 15% correction (i.e. a major correction). For today’s chart, however, a rally is being defined as an advance that follows a 30% decline (i.e. a major bear market). As today’s chart illustrates, the Dow has begun a major rally 13 times over the past 111 years which equates to an average of one rally every 8.5 years. It is also interesting to note that the duration and magnitude of each rally correlated fairly well with the linear regression line (gray upward sloping line). As it stands right now, the current Dow rally that began in March 2009 (blue dot labeled you are here) would be classified as well below average in both duration and magnitude. Where’s the Dow headed? The answer may surprise you. 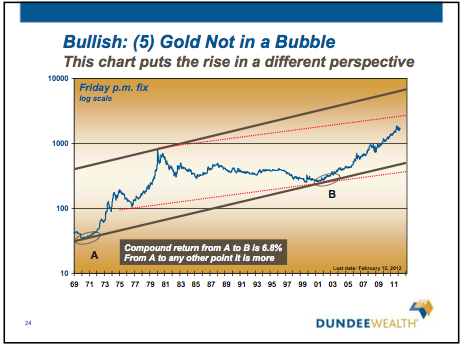 Find out right now with the exclusive & Barron’s recommended charts of Chart of the Day Plus. While Greece has been criticized for just about everything, especially about going on a debt binge, to be fair, that is the kettle calling the pot black. Let’s be honest. ALL Western governments have been doing the same thing. 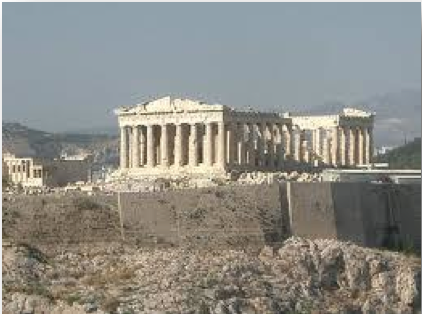 Greece is merely the PRELUDE to the Decline & Fall of Western Society. The trustee overseeing MF Global’s liquidation has come out and confirmed that the amount of customers’ funds of the failed brokerage are now expected to be at least $1.6 billion. This gap has now risen from the previous estimate of $1.2 billion. This is the biggest financial crime perhaps in history far worse than Madoff. This is the outright theft of client funds that nobody is being called to account for no less the recipients of such funds being made to return them. About $1.2 billion previously reported as missing has been traced to customer accounts and banks. Analyst and author of Grant’s Interest Rate Observer offers some historical trends on interest rates, monetary policy and what is still strong in America. Here is the direct audio link. 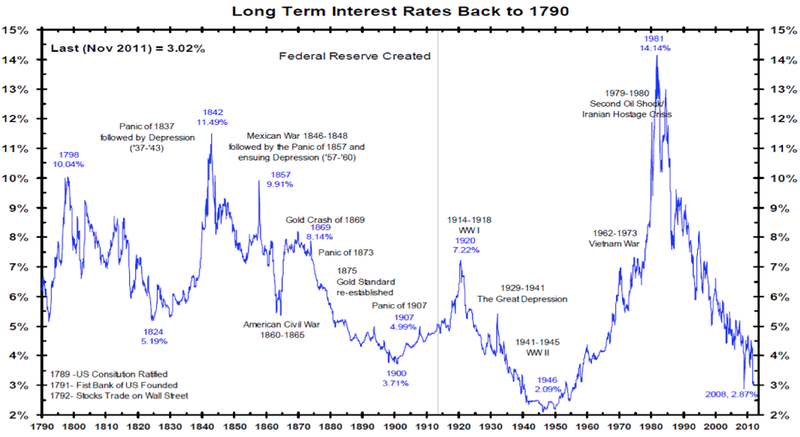 This chart since 1790 ties in nicely with discussion of the generational cycles in interest rates and underlines just how insanely low rates are today. Best advice to those still in debt: don’t use current rates to borrow more–use them to become debt free. History assures us that this-low-rate-time too shall pass. I personally look forward to the next phase where Central Banks are taken out of the driver’s seat, budgets are balanced, and markets are left to freely find fair value again. It is not a question of if–centuries of history tells us this will happen. The question is just how much mess and pain must intervene before they do. Danielle worked as an attorney until 1997 when she was recruited to work for an international securities firm. Becoming a Chartered Financial Analyst (CFA), she now helps to manage millions for some of North America’s wealthiest families as a Portfolio Manager and analyst at the independent investment counsel firm she co-founded Venable Park Investment Counsel Inc. www.venablepark.com. 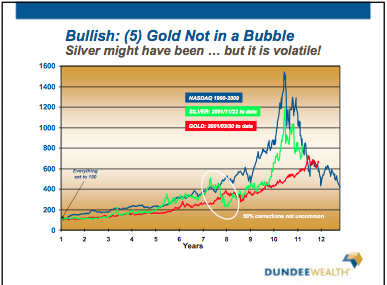 In recent years Danielle has been writing, speaking and educating industry professionals as well as investors on the risks and realities of investment behaviors. As with equities, early weakness reversed to modest gains on the session. Silver, in particular, was pushing toward my projected 30-31 pullback zone, but stopped at 32.56 before closing at 33.52. I think you need to keep a solid core holding here. This baby could take off at a moment’s notice and we could suddenly see it trading at 37 on its way to my 42-43 projected target zone (not to say it couldn’t go higher at a later time). Gold touched 1704.30, just above last Friday’s 1703.40 low, so it was clearly demonstrating some relative strength as well. As you know, I was looking (hoping) for a pullback at least into into the mid to high 1600s. Famous last words? Core positions need to be held here for the same reason as for silver. Silver has entered into a shallow short term correction. 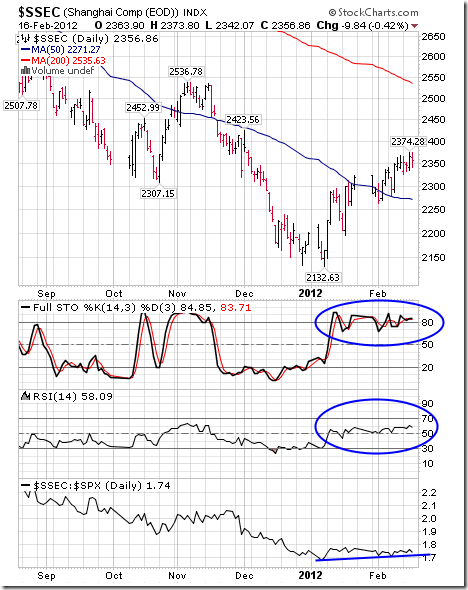 Short term momentum indicators are trending lower, but have yet to show signs of bottoming. 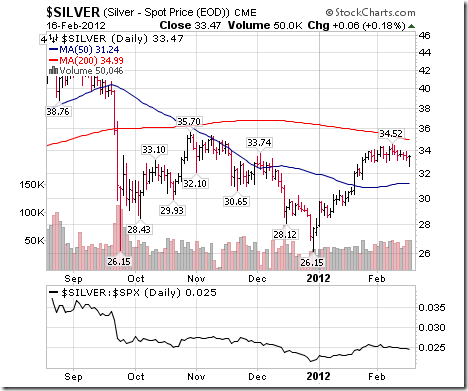 Downside risk is to its 50 day moving average currently at $31.24. Strength relative to the S&P 500 remains positive. Seasonal influences remain positive until May. 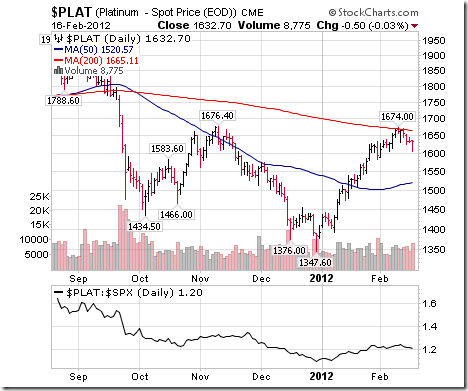 Add to positions closer to its 50 day moving average. Ditto for Platinum! A shallow short term correction has started. Seasonal influences are positive until May. Strength relative to the S&P 500 Index remains positive. Adding on weakness closer to its 50 day moving average makes sense. Canadian lumber stocks are showing technical signs of completing a shallow short term correction. 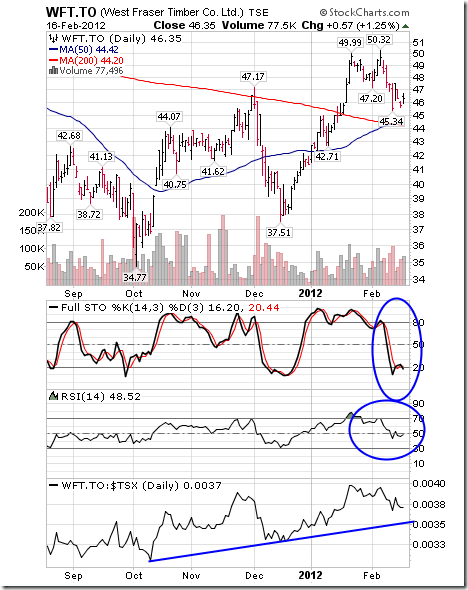 Short term momentum indicators are trying to recover from oversold levels. Strength relative to the TSX Composite Index and S&P 500 Index remains positive. Seasonal influences remain positive until mid-April. The Shanghai Composite Index continues to move higher. Short term momentum indicators are overbought, but continue to trend higher. Strength relative to the S&P 500 Index remains positive. Seasonal influences remain positive until May. Mark Leibovit and VRTRADER.COM has been consistently ranked in the group of top market timers by TIMER DIGEST. Two of note: Mark was ranked #1 Gold Timer at mid-year 2011 and finished #2. He was the #2 Gold Timer for the 10 year period ending 12/31/09.